German and Austrian music of the late eighteenth and nineteenth centuries stands at the heart of the Western musical canon. In this innovative study of various cultural practices (such as music journalism and scholarship, singing instruction, and concerts), David Gramit examines how music became an important part of middle-class identity. He investigates historical discourses around such topics as the aesthetic debates over the social significance of folk music, various comparisons of the musical practices of ethnic "others" to the German "norm," and the establishment of the concert as a privileged site of cultural activity. 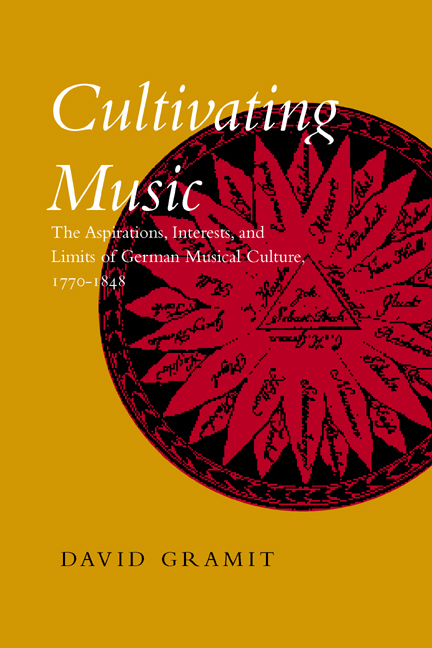 Cultivating Music analyzes the ideologies of German musical discourse during its formative period. Claiming music's importance to both social well-being and individual development, proponents of musical culture sought to secure the status of music as an art integral to bourgeois life. They believed that "music" referred to the autonomous musical work, meaningful in and of itself to those cultivated to experience it properly. The social limits to that cultivation ensured that boundaries of class, gender, and educational attainment preserved the privileged status of music despite (but also by means of) their claims for the "universality" of their canon. Departing from the traditional focus on individual musical works, Gramit considers the social history of the practice of music in Austro-German culture. He examines the origins of the privileged position of the Western canon in musicological discourses and argues that we cannot fully understand the role that canon has played without considering the interests that motivated its creators. David Gramit is Associate Professor of Music at the University of Alberta.